With only 2 stages left after this race from Bourg-d’Oisans to Le Grand-Bornand, I am getting that feeling in my stomach that I get on the 23rd of December – only two more days to Christmas (i.e. Stage 21 on the Champs Elysees in Paris). The peloton looks exhausted, and the race organisers have finally matched the challenge that the Giro d’Italia provides to the UCI Pro Tour. When I switched on the coverage (and it started early on a Friday night), Pierre Rolland (from Showboating Europcar – who as a result of their showboating have successfully secured continued sponsorship from the car hire company) was belting out a brilliant breakaway paired with Ryder Hesjedal (from the Rebellion – Garmin-Sharp). Initially the breakaway had formed by Hesjedal and Jon Izagirre (Euskatel-Euskadi), but when Rolland had caught them he turned the screws and Izagirre (who has been having a good Tour so far) got dropped. 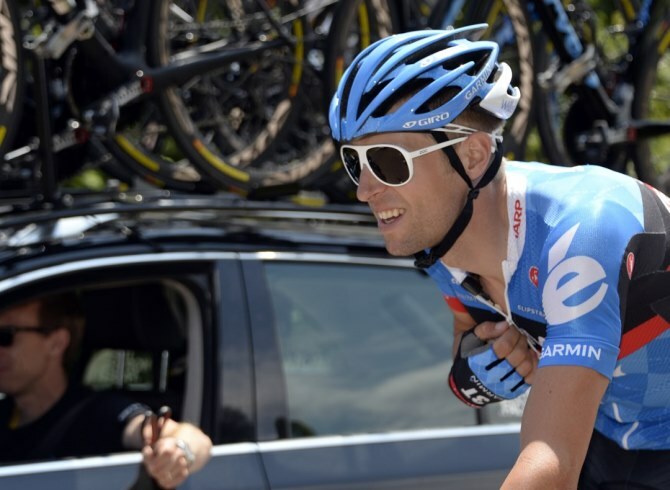 Side note – Ryder’s sunglasses have caused much controversy in the Tour this year. Yes, us cyclists and cycling fans are very partial to fashion faux-pas (can you hear us Pierre Rolland) while riding on two wheels. Ryder is a champion, but what is going on with those glasses? Hesjedal and Rolland were keeping away another group of breakaway riders lead by Daniel Navarro (of Cofidis – another team who has been unusually missing in action and hiding in the peloton for this year’s Tour). Navarro’s group also contained Rui Costa (Movistar) who showed his form a couple of stages earlier to win a spectacular solo mountain ascent. Navarro was also in the hunt for the Polka dots, so this was a looming battle with Rolland. Rolland decided to turn the screws again, and he had eyes on Polka dots. Hesjedal hit the wall, and I think this reflected his 2013 season in a nutshell – not quite there. Second side note – if you missed last night’s stage then you missed probably the best roadside display in the town of Marlens, where a couple of genius handymen created a suspended wooden riding cyclists who pedalled on a cable alongside of the road – and it moved at speed. It was brilliant! Then for the first time this year the Tour was hit by adverse weather. This was the prompt for one rider, Costa, to go on the attack and chase down Rolland. This was a ballsy chase, and he eventually caught up with Rolland. The two rode together for a short time until Costa did to Rolland what he had done earlier to his fellow breakaway riders. 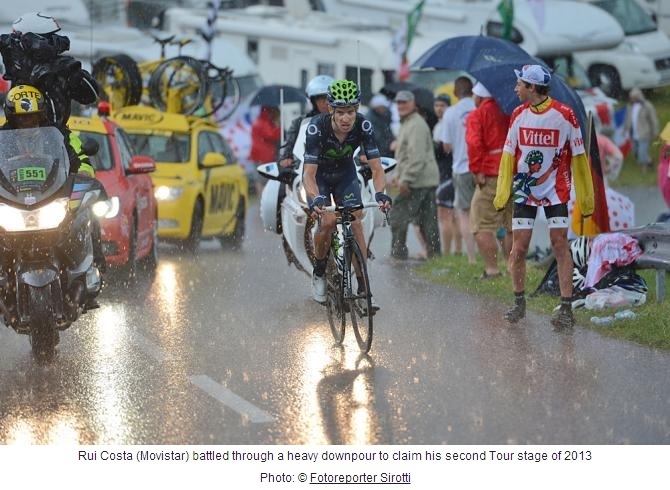 Costa turned the screws and belted it out to what would be an eventual solo win for the last 15 or so kilometers. Brilliant riding! I feel a bit robbed watching this. Costa was one of the riders who joined his teammate Valverde when he got the mechanical, and if they hadn’t made the huge tactical stuff up and waited for the team car we could have had three Movistar riders to attack the Empire alongside the Saxo-Tinkhoff boys of the deli merchant El Pistolero (Contador). The top GC riders did not really attack each other and would finish 8 min 40 sec down on Costa. They really looked spent, with El Pistolero and Quintana (Yay!) resting easy and matching the Froome-dog. I reckon that only Quintana has the get up to try and attack for second place tomorrow. I have resigned myself to the fact that the Froome-dog is likely to win the Maillot Jaune, and to be honest he deserves it (even though he rides for the evil Empire – Team Sky – owned by Murdoch). 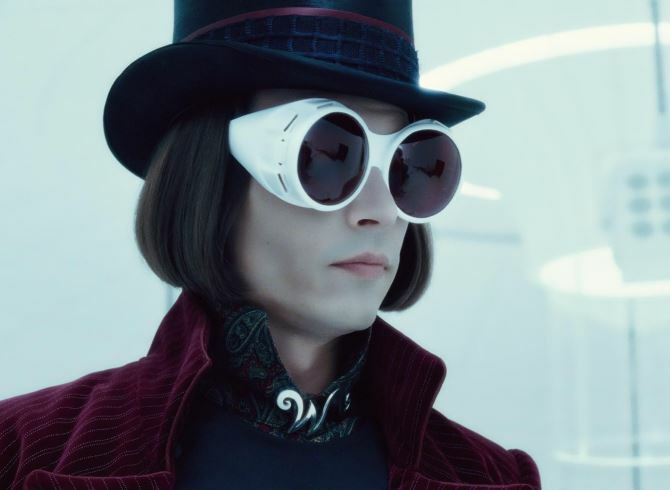 If he does win, he has one Richie Porte to thank greatly (supplier of a wind break and M&M’s). 1. Pierre Rolland – went on the attack in a big way, chasing polka dots. Unlucky not to win the stage. 2. Rui Costa – awesome riding and showed his class. 3. Jack Bauer – even though I didn’t write about him, apparently he face planted into a barb-wire fence in a nasty tangle with banana peels on one of the descents. He was forced to retire. 4. Jens Voigt – because the Jensie is awesome and riding tough in the Tour at the age of 41. Big respect!